As you can sense from the choice of words, Thompson’s selection comes with a patina of age; we don’t talk generally like this anymore. Our voice and written communication tends to be static, more abrupt almost cryptic in a texting sort of way. Maybe our way of talking is being affected by our twittering type texting, time will tell. But what gets me here I am pontificating about how stiff the choice of his words, but in reality who am I to criticize? Now Thompson gets into the heart of bone strength descriptions. When we wake up bounding to the clatter of an alarm, we jump onto the floor without once thinking how much force gets absorbed as the feet make first contact scrambling at the start of a new workday. We don’t hesitate one second to think of the forces running into our foot bones transmitting up our leg into the pelvic girdle as the daybreak erupts grabbing at the bathroom door for what our cousin calls, la toilette. All these mechanical motions all these transmitted forces running through our entire skeleton, with not a thought about the whole process. 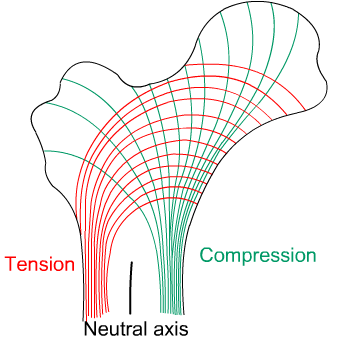 The two combined forces are compression and tension, which is what tensegrity is all about. So here we have Thompson’s reflections from 1942 that leap forward to Donald Ingber’s tensegrity essay in Scientific American on The Architecture of Life published in 1998. That is the kind of thing that happens in science. Observations can be totally insightful easily 50 years before they start breaking out of the science jargon world before reaching into the public’s perception. I love how eloquent the use of a bubble shapes description, it gives such a clean image of the forces that show either compression or strain at the same time. If you’ve ever watched an older man walking along the beach, his legs could be bowed out as a badge of his decades of their use. “In a like manner a vertical pillar, if unevenly loaded (as for instance the shaft of our thigh-bone normally is), will tend to bend, and so to endure compression on its concave side, and tensile stress upon its convex side. In many cases it is the business of the engineer to separate out, as far as possible the pressure-lines from the tension lines, in order to use separate modes of construction, or even different materials for each. In a suspension-bridge, for instance a great part of the fabric is subject to tensile strain only, and is built throughout of ropes or wires; but the massive piers at either end of the bridge carry the weight of the whole structure and of its load, and endure all the ‘compression-strains’ which are inherent in the system. Very much the same is the case in that wonderful arrangement of struts and ties which constitute, or complete, the skeleton of an animal. If that isn’t a prescient prediction for a description of tensegrity I am simply stunned at such relevance from 1942. When I contacted Donald Ingber last year asking him via e-mail,’ Is the brain a tensegrity structure?’ since I could find no citations anywhere in the medical literature reflecting the importance of tensegrity shape with the brain. Ingber responded, in a very simple fashion and eloquently told me, basically, how could it not be? Thompson has brought the balance of compression to tension as it reveals itself in the skeleton. I had my own biases about bone being some sort of static structure that’s just there. Bone is this wondrous dynamic substance that lets us bound out of bed in the morning as we race across our own bedrooms. Bone grows as bones deposit onto bones as bones absorb themselves slightly changing shape all the time, yet all changes unseen, happening beneath our skin. And bones can fracture -that’s when we notice how important they are. “The second point requires a little more explanation. If we imagine our loaded beam to be supported at one end only (for instance being built into a wall), so as to form what is called a ‘bracket’ or a ‘cantilever,’ then we can see, without much difficulty, that the lines of stress in the supported beam under the load run like compression lines starting at the wall then veering vertically down ward (looking like the distance perspective of painted track and field lanes) but where the bracket is fastened to the wall there is pressure directed horizontally against the wall in the lower part of the surface of attachment; and the vertical beginning and the horizontal end of these pressure-lines must be continued into one another in the form of some even mathematical curve-which, as it happens, is part of a parabola. The tension lines are identical in form with the compression lines, of which they constitute the ‘mirror-image’; where the two systems intercross they do so at right angles, or ‘orthogonally’ to one another. Yet it is often possible to weaken one set of lines at the expense of the other, and in some cases to do altogether away with one set or the other. For example, when we replace our end-supported beam by a curved bracket, bent upwards or downwards, we have evidently cut away the greater part of the tension lines, and in the other the greater part of the compression lines. It’s as if instead of bridging a stream with our beam of wood we bridge it with a rope, it is evident that this new construction contains all the tension lines but none of the compression lines of the old.” Bones have to grow, that is the dynamic property that tensegrity compression-tension balancing accomplishes and bones age, bending as they change shape supporting the same weight. ‘Bone is marvelous material. There are few substances, natural or man-made, that can match its durable combination of strength and flexibility. The femur of an adult athlete, for example, is so strong it can bear a vertical load of nearly 2000 lbs. Other bones, such as those in the middle ear, are so delicate they can transmit infinitesimally small sound vibrations so accurately that you can hear the exquisite overtones that issue forth from a Guarneri violin. Jeffries Wyman from the Boston Society of Natural History in 1849 wrote about animal mechanics: on the cancellated structure of some of the bones of the human body. Wyman came much closer to the truth in a paper seemingly neglected and forgotten. “1. The cancelli of such bones as assist in supporting the weight of the body are arranged either in the direction of that weight, or in such a manner as to support and brace those cancelli which are in that direction. In a mechanical point of view they may be regarded in nearly all these bones as a series of ‘studs’ and ‘braces’. 2. The direction of these fibres in some of the bones of the human skeleton is characteristic and, it is believed, has a definite relation to the erect position which is naturally assumed by man alone.” A few years afterwards the story was told again, and this time with convincing accuracy. 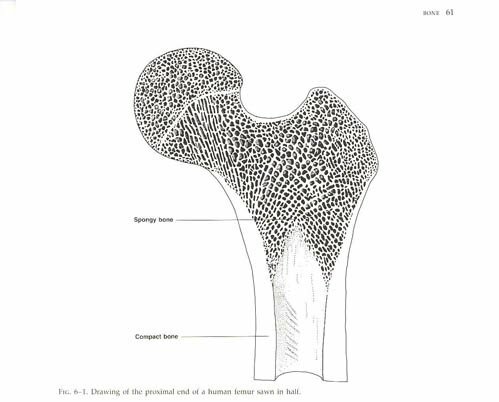 “It was shown by Herman Meyer and Julius Wolff that the trabeculae, as seen in the longitudinal section of the femur, spread in beautiful curving lines from the head of the femur to the hollow shaft of the bone; and that these linear bundles are crossed by others, with so nice a regularity of arrangement that each intercrossing is as nearly as possible an orthogonal one: that is to say, the one set of fibres or cancelli cross the other everywhere at right angles. A great engineer, Professor Culmann of Zurich, to whom the method of ‘graphic statics’ was formulated happened to come into his colleague Meyer’s dissecting room in 1866, where the anatomist was contemplating the section of bone. It took scientists becoming ambitious to attempt making bone, to grow bone cells into bone structure in the laboratory, they realized bone needed a structure, a scaffold to grow onto and into, with this support mesh, they have begun crude attempts that mimic bone growth. Early attempts from the year 2000 have begun to recognize the contribution of cellular assembly involving bone encompassing stress and strain incorporated into the shape of the design. Yet the eloquent words of stress and strain echoing from the early pioneers from the late eighteenth century were basically ignored and lost in time. Their century old voices have now been rekindled to reveal their exquisite observations. It will be up to our own attempted experiments to verify bone metabolism to hopefully open the truth first voiced from the bone tensegrity pioneers whose compelling bone understanding was so far ahead of its time. Bone remodeling is about to catch up to using tensegrity strain-compression shape within bone as the mechanical design to how the brain regulates bone shape. Our question has now a deep heritage behind it, does bone change with minor traumatic brain injury? Does tensegrity based bone changes occur following concussion brain injury? If I were to phrase it another way, bone changes shape as we age bone becomes weaker, the tensegrity balance between bone growth with bone absorption is lost, bone is no longer thicker in areas where Nature designed it to be thicker to better support the forces. As bone diameter changes, bone becomes weaker to fracture more easily. The entire shape design is now longer in harmony of stress with strain. We are attempting to learn the conversation as it were between the bone and the brain, what part of the brain tensegrity link in terms of balance is now off?